Helps to reduce the risk of antibiotic-associated diarrhea. Contains 5 billion active cells, concentration guaranteed until expiry date. Includes documented probiotic strain Saccharomyces boulardii. Formula indicated for reducing diarrhea associated with antibiotics. Safety and effectiveness clinically validated for adults and children. Maltodextrin, vegetable capsules (hypromellose), magnesium stearate, titanium dioxyde, ascorbic acid. Take one capsule twice a day at breakfast and at dinner. Take simultaneously with antibiotics treatment. Take at least 2-3 hours before or after antifungal. * This product does not contain: gluten, peanut, tree nuts, sesame, eggs, fish, shellfish, wheat or sulphites. This product may contain traces of dairy proteins and soy. This means that antibiotic treatment is not a guarantee of success. On the other hand, if they do their job, the antibiotics will attack all the bacteria, confusing the good and the bad. 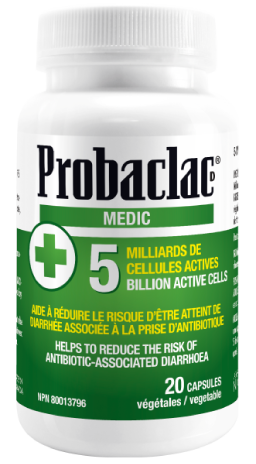 The Medic supplement contains Saccharomyces boulardii yeast at the rate of 5 billion active cells per capsule. People of all ages are at risk of hosting drug-resistant bacteria, especially if they are at their umpteenth antibiotic therapy. How to take Probaclac Medic ? 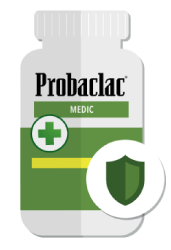 Children over 6 years of age, adults and the elderly, should take Probaclac Medic simultaneously with the antibiotic for a synergistic effect or 2 hours before or after if it is an antifungal (depending on the prescription, it will be once or twice a day). This strain has an antimicrobial role and is especially approriate for the prevention of antibiotic-associated diarrhea. This strain plays an antimicrobial role and is particularly indicated for preventing antibiotic-associated diarrhea and combating nosocomial diseases such as Clostridium difficile and Escherichia coli. Since the yeast Saccharomyces boulardii is not affected by antibiotics, they form together a formidable team against pathogenic bacteria! Do I have to keep the probiotics in the fridge once the bottle is open ?